Ladies and Gentlemen,- Another year in the life of our Society has rolled around bringing us together at this our fourth annual meeting. I thank you all for the measure of your interest in the Society's work, and for the helpfulness and support you have given to me personally, as the President in the year past. It is the province of an historical society not only to gather and preserve historical data of the distant past, relating to town and vicinity, but to record events and incidents as they pass for those of the future who may desire to consult its records and publications. In the year 1904, seven papers were read before the Society, and five, including the President's Annual Address, have been printed and circulated among its members and the public. At the last annual meeting, this Society called the attention of the town to the fact that the 200th anniversary of the town's incorporation would occur in 1905. As a consequence, the Society prepared an article for the warrant of the annual town meeting providing for the appointment of a committee of twenty-five, which was appointed by the moderator. That committee has held several meetings and will report at the next annual meeting of the town a plan for the celebration, which will doubtless be accepted by the town. The year in other respects has been important in the annals of the Society and of the town, and the Society is becoming a strong factor herein as it should, if wise counsel and harmony continue to prevail among its members as have been the case in the past. The membership has been increased in the past year by the addition of seven to its roll, while there have been three withdrawals, and three deaths, leaving a net gain of one, and the present number 153. The deaths were those of Charles L. Flint, Frank E. Sweetser and Mrs. Sarah E. Corey. Mr. Flint died at his home, 40 Harris street, Brookline, on June 9, 1904, aged 43 years. He was born in Boston and was the son of the late Hon. Charles L. Flint, for many years secretary of the Massachusetts Board of Agriculture. The son was also a member of the Board at the time of his death. He came to Brookline to reside some fifteen years ago and had been a member of this Society three years. Mr. Frank E. Sweetser died at his home in Brookline Warren street, December 9, 1904, in his fifty-fifth year. He was born in Charlestown, Mass., and was the son of the late Isaac H. Sweetser, Esquire, President of the Washington Insurance Co. of Boston, and at his death President of the Boston Board of Marine Underwriters. The son was brought up in the Insurance Company presided over by his father, and succeeded to its presidency upon his father's death. The company was later liquidated and he satisfactorily wound up its affairs, and later wound up the affairs of the Boylston Insurance Co. Since then he had been engaged in the care of his own and other estates. He came to Brookline to reside about ten years ago, and had been a member of this Society for some three years. He was highly beloved by his friends and greatly respected by his business associates. Mrs. Sarah E. Corey died at her home on Washington street, near the Brighton line, November 22, 1904, aged 71 years. She was the widow of the late Timothy Corey, 3d, and had resided in the house in which she died since her marriage with Mr. Corey, more than fifty years ago. She had been a member of the Society a little over a year at the date of her death. She was the mother of a large family of children, a loveable woman, a kind neighbor and friend, and a loss, not only to her family but to this Society and to the community in which she had resided for so many years. died at his home on Winthrop road, Brookline, January 31, 1904, aged 66 years 1 month and 27 days, he having been born in Plymouth, Mass., November 4, 1838. He was of Pilgrim stock, and traced his descent from Sir Edward Drewe, knighted by Queen Elizabeth of England, in 1589. He was elected to membership in this Society shortly after its formation, but the records show that he did not qualify as such. His life career was a notable one, and his identification with the affairs of this town, from the time he here took up his residence to the date of his death, make it proper for this Society to record an outline of the same. He was educated in the common schools of his native town and at an academy in Connecticut, studied law and was admitted to the bar in 1860 at Plymouth, and began its practice in that town. At the call of his country he, in 1861, enlisted in the 3d Massachusetts regiment for three months. When the time of his enlistment expired he returned home, but soon enlisted again in the 18th Regiment for three years as Lieutenant. He served in the Army of the Potomac, was in various engagements, was wounded in battle, and in 1864 was transferred to the Veteran Reserve Corps, from which he resigned in September, 1865, he having been promoted to a Captain in 1862. He returned home, resumed the practice of law in Boston. In 1867-8 he was a member of the Massachusetts House of Representatives from Plymouth. He married in February, 1867, Miss Mary A. Bradford, daughter of Samuel Bradford of Plymouth. Mr. Drew removed to Brookline in 1869, where for nearly thirty-five years he resided, as an active, influential and useful citizen. He was elected a member of the School Committee in 1872, upon which he served four years. He was elected Water Commissioner in 1873 for two years, and in 1875 for three years. He was chairman of the commission the last three years, and wrote its report recommending to the town the establishment of a permanent Water Board. In 1875 he was elected a Trustee of the Public Library, in which office he continued to serve until his death- several years of which he was chairman of the Board. For four years, from 1880 to 1883 inclusive, he was chairman of the Board of Selectmen, and was again a member of the Board in 1894 and 1895. He was elected Moderator of the annual town meeting in 1872, and served in that capacity at many times in following years. He served on many important town committees, annual and special. He was Trial Justice of the town for ten years or more, and when the Police Court was established in 1882, the name of which was changed to Municipal Court of Brookline in 1898 - he was appointed its chief justice, which office he held until his death. He was also a member and Past Commander of C. L. Chandler Post, No. 143, G. A. R., of Brookline, in the rooms of which we are now assembled. Besides these official positions, he was a member of the Brookline Thursday Club from its formation to the date of his death, and of other organizations, which took up much of his time and thought, and yet, with all these positions and their exacting duties, he found time for reading and study, which made him one of the best informed in general literature that one would be likely to come in contact with in a lifetime. Many of the members of this Society knew him, some intimately, and others, perhaps, less so, but all who were associated with him, officially, socially, or fraternally, can attest to the fact of his having been a faithful town officer, a warm friend and a model citizen. died at his home on Perry street, Brookline, December 24, 1904, aged 89 years and 10 months. He was born in Brunswick, Me., February 13, 1815, came to Brookline in 1844, where he ever after made his home. He was a carpenter and builder by trade, and among the monuments to his industry and skill as a mechanic in Brookline, the most conspicuous is the Town Hall, erected in 1872, which, except the foundation and its stone walls, was his work. In 1886 he was elected a member of the Brookline Water Board, upon which he served fifteen years, fourteen of which as chairman. When the office of Inspector of Buildings was established in 1889, the well-known ability and integrity of Mr. Melcher suggested him for that position. He was appointed, and filled the place with honor to himself and with satisfaction to the town. A few years ago, age and infirmity caused him to relinquish the position he had so long held, and since that time he lived in retirement, having the esteem and friendship of his neighbors, friends and acquaintances to the close of his life. He had been a member of the Massachusetts Charitable Mechanics' Association for more than fifty years, of the Pine Tree State Club of Boston from its formation, and also of other organizations, including the Masonic order. At the institution of Bethhoron Lodge of Masons in Brookline in 1870, he was a charter member and its first Senior Deacon. At the first recorded meeting of the Lodge, December 13, 1870, he was one of the eleven members present, and by his death but one other is living at this time. When Masonic Hall at the corner of Harvard and School streets was being built, in 1875, Mr. Melcher and two other members were appointed a committee to confer and arrange with the builder, the late Oliver Cousens, to fit it for Masonic use, which was done under their supervision, and the Lodge removed to it from Lyceum Hall in the lower village, and occupied it as its home for the next quarter of a century. He was an honorary member of the Lodge for some years before his death, at which time, in point of years, he was its senior member. He was a worthy man, and exemplified the character of such by his upright walk through life. Life is work, hand and brain. Life's a prize, lost or won. WASHINGTON STREET FROM SCHOOL AND CYPRESS TO THE BRIGHTON LINE. This section of Washington street was a part of the Water town road, one of the three ancient and historical roads of Brookline. 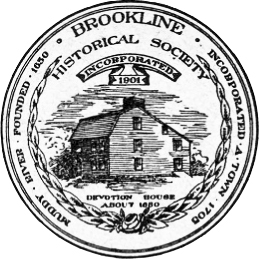 In 1902 a paper was read before this Society from notes of Martin Kingman, Esq., entitled "Brookline Village, 1865 to 1902, from the Roxbury line to School and Cypress streets." It is now the purpose to continue the narrative of the places, houses and people upon that street as it existed in 1865, with something of its history before and after that date. The Congregational Church was dedicated August 20, 1844, the membership then consisting of twenty-eight persons. The following May, Rev. Richard S. Storrs, Jr., was called to the pastorate, and in October he was installed. His pastorate was but a little over a year when he accepted a call to the Church of the Pilgrims, Brooklyn, N.Y., where he remained to the end of his life. Other pastors in this building were Rev. Joseph Haven, Rev. J. L. Diman, Rev. G. G. Carpenter, and Rev. G. M. Wines. In 1873 the new church was built on the corner of Marion and Harvard streets and the old edifice was sold to the Methodists. The Methodists occupied the building for a time, and in it preached the Rev. Mr. Winslow and others, but the undertaking was not a financial success and the place was sold to Mr. James H. Beals, who with others formed what was called the Channing Unitarian Church of Brookline. That, like its predecessor, failed for lack of financial support and the building and lot were sold to the Bethany Sunday School Association, connected with and partly supported by the church and society for which it was originally built, and in whose hands it rests at this time. Opposite the Bethany Building, on the corner of Cypress and Washington streets, stood until about thirty years ago, when it was removed to Pearl street, where it now stands, a gambrel-roofed house, said to have been built before 1740, and in that year occupied by Captain Samuel Croft. After that date for a hundred years or more it was occupied by different families, among which that of Dr. Aspinwall, and lastly by Dr. Stephen Salisbury and family. The land contained in the Croft places was a part of that allotted to John Cotton, which came into possession of the Sharps and from them to the Crofts. The elder Croft was born in 1700, and died in 1771. He and his son both bore the title of Captain. Captain Croft, the elder, built in 1765, a two story house on the north side of Washington street, on what is now the Chandler estate. At the time of his father's death the property was owned by Captain Samuel Croft, Jr., whose wife was a Sharp. In 1814 Capt. Croft died and his wife died some years later. After their death the place was occupied by various parties and later was sold to Mr. John Kendrick, and still later to T. P. Chandler, Esquire. In the old house Miss Hannah Adams, a native of Medfield, Mass., resided for some years, a woman of literary attainment and a local celebrity of the time. A memoir of her, begun by herself and completed by a friend after her death, is in the Brookline Public Library. After the purchase of the place by Mr. Chandler, the old house was removed to Thayer place where it still stands and does duty as a dwelling and upon the lot where it formerly stood was built in the fifties the house now occupied by his son, Alfred D. Chandler, Esq., a member of this Society. nearly opposite the Chandler place, was built sixty odd years ago on land which was formerly a part of Croft farm, and was built, owned and occupied by Mr. Samuel Crafts until his death in 1856, and by his widow until her death fifteen or twenty years later. Mr. Crafts was born and lived in his youth in the southwestern part of Brookline; afterwards he lived in the house owned by his uncle, Stephen Sharp, until he built the house above described. After the death of his widow, Mr. John W. Kennan from Bridgewater bought the place in 1884, and sold the old house to Mr. T. B. Griggs, who removed it to the corner of Washington street and Griggs road, where it still does duty as a dwelling. Mr. Kennan built the fine house and stable upon the lot, which he occupied until his death in 1899, and are now held by his heirs. THE DR. WILD HOUSE AND PLACE. Dr. Charles Wild came to Brookline in 1818, and boarded with the widow of Capt. Samuel Croft, who conceived a warm friendship for the young doctor, and gave him two acres of land from her farm for a house lot. Dr. Wild was born in Boston in 1793, graduated from Harvard College in 1814, studied medicine and came to Brookline at an opportune time to settle and gain a practice. He built his house in 1820, married, reared a family and became the trusted physician, friend and adviser of the people of the town. For more than forty years he lived and labored in the town, where his presence at social, fraternal and other gatherings was hailed with pleasure. He died in , Providence, R. I., in May, 1864, aged 71 years. The late Edward A. Wild, a volunteer in the War of the Rebellion, who rose from captain to a brigadier-general, and Capt. Walter Wild also in the service of his country in that war, were his sons. After the death of Dr. Wild, the house and place were sold to the late Deacon William Lincoln, who occupied it for some years and then sold it to Mr. Stephen D. Bennett, who occupied it a number of years and then sold it to the late Arthur W. Blake in 1883, and in the heirs of whom the title rests at this time. Its occupants since that time have been Wm. Whitman, Esq., and Mr. Henry A. Young. The house still occupies a commanding position upon the street, is kept in fine repair, has a beautiful lawn in front, and naturally attracts the notice of passers-by. The southeastern slope of what is now known as Aspinwall Hill comprises the Blake estate, to which has been added in recent years, a part of the Aspinwall and Moses Jones estates. The original estate, except as above stated, was a part of the Croft farm, purchased by Mr. Lewis Tappan, who built the stone house thereon over eighty years ago. Mr. Tappan occupied the place a few years, and upon his removal to New York the house was occupied by Mr. Nathaniel R. Cobb, and later by Henry Robinson, an English gentleman. All its owners and occupants have been men of wealth and taste, but none did more to make it a place of beauty and elegance than its two last, Mr. George Baty Blake, and after his decease his son Arthur W. Blake, also deceased. Upon this place much care and expense have been expended in the preservation of the native forest trees, in planting others, and in the culture of shrubs and plants, arranged in groups and trimmed to give to the eye a view of grandeur and beauty not elsewhere surpassed in the town. were described in an address before the Society, and published with its proceedings January 28, 1903, and need no further mention here except to state that the houses lately erected thereon have no special historical interest for the antiquarian>or even citizens of modern Brookline. This narrative carries us on the south side of Washington street to Beacon, laid out in 1853 and constructed the year following. We will now retrace our steps to the border of the Chandler estate on the north side of Washington street, which, until recent years, has been without change. A large part of the land along that side was of the John Cotton early allotment, and afterwards went to the Sharps, Crofts and Crafts, and later to others, having " the fresh brook " later known as " Tannery Brook " coursing through it on its way to Muddy river. Next west of the Chandler place, is what was known as the Candler Cottage, built, owned and occupied until her death by the mother of the late Hon. John W., and Col. Wm. L. Candler, when she came to the town to reside fifty years ago or more. After her death the place was sold to Augustus Kreissman, and later to John M. Graham, the present owner. Stands next in line of western advance, with the house thereon built, owned, and occupied by Mr. Dana, then sold to Daniel W. Russell, and by him sold to its present owner and occupant, Mrs. Cornelia M. Crocker. Beyond that, where now stands "The Aspinwall" and "Ambleside," the land of the Martin L. Hall estate stretched across the brook from Harvard avenue to Washington street. Beyond Park street to the tanneries, stretched the unimproved lands of Thomas H. Bacon, Deacon Thomas Griggs and of his son, Thomas B. Griggs, with but two houses upon that stretch of street, the Griggs houses. THE GRIGGS PLACES consisted of a farm extending to Beacon street, with tannery brook and meadow extending through its length. The first of the two houses thereon was the more modern; was built and occupied by Deacon Griggs until his death, and after that went to his daughter, the late Mrs. Saxe. The other house, much more ancient, built also by the deacon in his younger days, and in which his children were born, afterwards occupied by his son Thomas B., stood until a recent period opposite of what is now Gardner road, and is now standing farther in the rear upon Griggs road. Other houses now line the Washington and Beacon street fronts of the farm, but all have been of recent construction. John Robinson and Enos Withington, two young men from Dorchester, came to Brookline about 1790 and started tanneries, a line of business with which they were familiar. They purchased land of Robert Sharp, which was then a tangled swamp with a brook coursing through it, which became the site of their tanneries and where business in that line was carried on for nearly a century by John, the father, and Samuel A., the son. Mr. Robinson built his house in 1791, married Mr. Withington's sister, and settled in life and in the tannery business which he continued to carry on until his death January 13, 1855, aged 91 years and 6 months. He was succeeded in the business by his son, Samuel A., who also lived to the end of his life in the old house still standing on Fairbanks street and occupied by Edward Sharp, whose wife was a daughter of Samuel A., and grand-daughter of John, the builder of the ancient house. 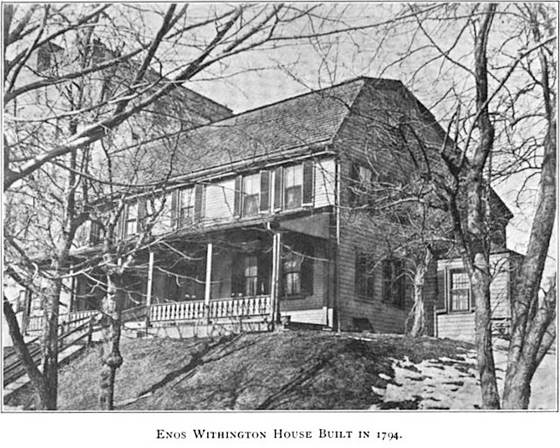 Mr. Enos Withington built his house near the house of Mr. Robinson in 1794, which is also standing and owned by the Brookline Gas Light Co., and occupied by George M. Stearns and family. Mr. Withington married Patience Leeds of Dorchester, a sister of Polly Leeds, the first wife of Elijah Corey, Sen., and of James Leeds, whose residence stood upon the present Public Library lot of Brookline. It is said that the Withington and Robinson houses were originally alike, but the latter having undergone changes which have altered its resemblance to the first named. Mr. Withington gave up the business of tanning hides early in life and devoted his energies to farming. He died at the age of seventy-four. The late Deacon Otis Withington of Harvard Church, and the late Moses Withington, honored treasurer of the town for many years, were his sons. The old homestead fell to Otis, the eldest son, who occupied it many years and then sold it to the Gas Company. He consulted his brother Moses about investing the price received. Moses did not like the idea of the property going to strangers, and thought his brother had sold the old homestead for too small a price, and with a twinkle in his eye said, " Otis, I think that the best thing you can invest the money in is to buy back the old house and the lot with it." A little beyond the Withington house was another house and tannery occupied and owned by Mr. James Robinson, a brother of Samuel A., until his removal to Westboro, when it was sold to a Mr. Warren, who continued the business of tanner. The business, however, did not prove profitable, and in consequence the place was sold to the daughter of the late Eben D. Jordan of Boston, and the tannery was given up. The house after that was rented for a time and then sold to parties who tore it down and erected upon the lot the brick building's now standing thereon. The greater portion of the land beyond Beacon street southwest of the crown of Corey Hill to the Brighton line, was formerly owned by the Corey families of the town. The first of that name to acquire and settle upon it was Timothy, son of Isaac of Weston, who came to Brookline when a young man, married Elizabeth Griggs, and spent the remainder of his days in town. He purchased of the heirs of Isaac Winchester about 1771, a two-story house which stood upon the present site of the stone house, and land lying on that side of the street, also the Whyte place on the opposite side of the street. Captain Timothy Corey was in active service in the Revolutionary War, and was at the Battle of Lexington, at which time his wife and two children sought shelter in the adjoining woods until the fright and danger from the enemy passing through the town were over. Captain Corey was an industrious farmer and a man of note in town and in town affairs. In the beginning of the last century his two sons. Deacons Elijah and Timothy, joined Washington Lodge of Freemasons in Roxbury. One day he said to his son Elijah, " I hear you have joined the Masons, tell me about them." Elijah replied, " If you really would like to know, father, I will propose you for membership." " Elijah, you may do it, for I don't want my sons to know more than I do in that matter." He was proposed, accepted, and became a member of Washington Lodge, and at the time of his death in 1811 he was chaplain of the Lodge, and his funeral was held from the First Parish Church with Masonic honors. His body rests in the Corey tomb in the Walnut street Cemetery. His widow continued to live in the old house until her death at the age of 92 years, after which it was torn down. In that house preaching was heard from different ministers, then called "New Lights." Father Grafton and a colored Baptist preacher sometimes preached there. All the family had been members or attendants upon worship at the First Parish Church, but the "New Lights" caused a secession of many of the people, some of whom joined the Baptists and some the Congregationalists. Captain Corey's two sons, Elijah and Timothy, joined the Baptists, and became deacons of the church founded in this town in 1828. 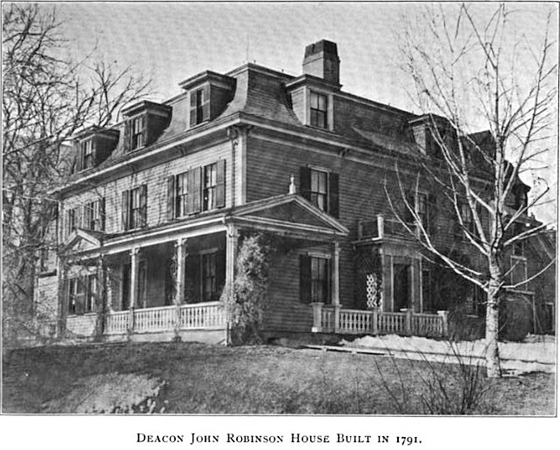 Deacon Timothy built the house next to the Brighton line early in the last century, in which he resided until he built the stone house in 1843. The old house is still standing in a changed and improved condition and has since that date been the home of his son, Timothy 3d, and of his family and heirs. After the death of his mother Elizabeth Griggs Corey, Timothy 2d tore down the old house purchased by his father from the Winchester heirs, and built upon its site the stone house now standing. That was in the days of the Miller excitement so called, about the coming of the end of world. A friend came along during the erection of the stone house and said to Deacon Corey, "Don't you know that the world is soon to come to an end, and you are building a stone house .'' " The good deacon's reply was : " Well, neighbor, if the world is soon to come to an end I might as well invest in a stone house as in anything else." Mary, the widow of Deacon Timothy, the daughter of Caleb Gardner of Brookline, lived in the stone house, with her maiden daughters until her death at an advanced age. The stone house is still standing and occupied by the 4th Timothy, and by others; he has no children, nor have his brothers, so that the name of Corey in that line is likely to become extinct. Next to the stone house this side, was the house built for the family of Elijah Corey, Jr., later occupied by the late F. Henry Corey for many years, who sold it to the late Ransom F. Evans, which was taken down in 1904, and a modern house erected upon its site. 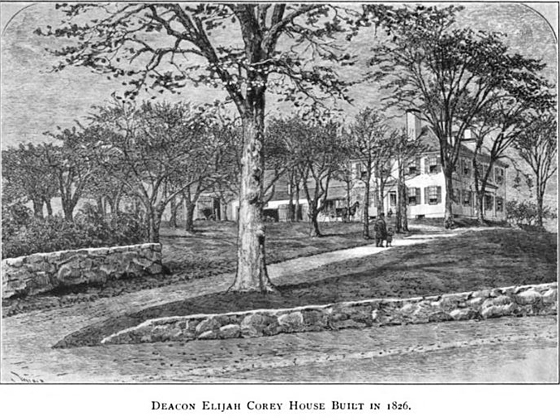 The mansion house built by Deacon Elijah Corey in 1826, upon the hill just beyond Beacon street, was occupied by him until his death. His first wife Polly Leeds died in that house in 1827, and in 1829 he married the widow of Captain Robert S. Davis, mother of the late Samuel C, Robert S., and Gen. P. Stearns Davis of Brookline. Deacon Corey died in that house in 1859, aged 86 years. His funeral took place at the Brookline Baptist Church, and his body was placed in the Corey tomb in the Walnut street Cemetery. His widow continued to reside in the house until her death which took place fifteen years or more later, when by the provisions of Deacon Corey's will, the house and place became the property of his daughter Elizabeth, wife of Rev. Barnas Sears, D.D., and at her death it went to her children among whom was Captain William B. Sears, a citizen of Brookline and a member of this Society. The house was occupied by Captain Sears for some years, and later was sold to the West End Land Co. After the sale, the house was demolished and the land connected with it was laid out in house lots and placed upon the market. The old house was built upon a ledgy hill, and the lawn, which sloped to the street in front with its curved driveway and shade trees, was made by blasting and removing the stones, which were used in building the causeway on the opposite side of the street for a private road up the side of Corey Hill. In that house lived Elijah Corey, Jr., in 1829, when his daughter Elizabeth Augusta was born, who in 1853 became the wife and companion of him who now addresses you, upon many of his voyages to foreign lands. The Coreys of Brookline for three generations have been shrewd, practical farmers and men of character and standing in the town. Elijah, Timothy, and Elijah, Jr., were projectors and original members of the Brookline Baptist Church, and the two first named were of its original list of deacons. All through their lives they not only designed the up-building of their church, but of the denomination at home and abroad. Deacon Elijah was a trustee of the Newton Theological Seminary, and a liberal giver to it. Mixed with his practical common sense was a noticeable streak of humor which sometimes found its way to the surface in course of conversation. Some years before his death, in 1855 I think, the writer called upon him at his home and enjoyed a pleasing and interesting conversation in the course of which he said : " You have been a great traveler, I hear! " That with some qualification having been assented to, he further said, "and so have I; I have been once as far as Providence ! " The next house to Elijah Corey's in the corner of Beacon and Washington streets was built some sixty years ago by the late Moses Withington on land purchased by his uncle, Deacon Corey. Mr. Withington, after occupying it a few years, sold it to Mr. Walter Lawton and built another house for himself on land adjoining, where he resided to the end of his life. In 1863 the corner house was sold to Oliver Edwards, who occupied it until his death, when it was sold to Francis Hunnewell, who sold it to James Stevenson, and he in turn sold it to the West End Land Co. just prior to the widening of Beacon street. The house was then moved up Washington street to a new foundation opposite the Timothy Corey place, where it now stands on land owned by the Eben D. Jordan heirs, and is still in use as a dwelling. and place upon the north side of Washington street, later owned by the Coreys, Bartletts and Jordans, was fully described by our member Mr. Charles F. White, in his papers on " John White of Muddy River." A few words, however, upon its later history seem necessary to round out the account of that locality down to 1865, and the present time. In the old house Deacon Elijah Corey celebrated his marriage with Polly Leeds, in it his children were born and he and they continued to reside until his mansion house on the opposite side of the street already described, was completed, and they moved into it in 1826-7. In 1843 Deacon Corey sold the house and forty acres of land running up to the top of Corey Hill to James Bartlett for $10,000, which was considered a large price for the old house and farm. Mr. Bartlett lived on the place until his death thirty years or more later, reared, and supported his children and family by dint of hard labor and close economy, from its products. After his death the place was sold to the late Eben D. Jordan of Boston as an investment, at the reported price of $115,000. That was in the 70s, and a few years later the farm with other lands added by purchase by Mr. Jordan, were laid out into streets and lots, new buildings were erected on some of them, and the old house disappeared before that march of improvement. Of Mr. Bartlett's family of six, one son survives, who is a resident of New Hampshire at this writing. All other houses in that section, and from School street to the Brighton line along Washington street except as have been mentioned, are modern in design and construction, and but one person who had reached a majority in 1865, is now left along its whole course - Mr. Thomas B. Griggs. In the forty years that have elapsed, all others have died or have removed elsewhere. Could any of them return and visit the scenes once so familiar to them, they would realize the vast changes which have taken place, and find themselves to be strangers in a strange land.